Know when and where to find the wildebeest this year. Known as one of the world’s seven natural wonders, the wildebeest migration offers one of the perfect sights on Tanzania safaris tours and here is it all about the annual wildebeest migration. The wildebeest is a type of antelopes that inhabit large plains on the African savanna where there is plenty of food for the wildebeest to eat since they are herbivorous animals. 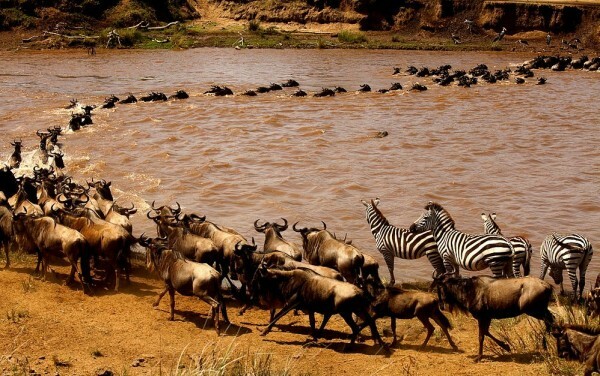 Every single year, over a million wildebeest, zebra and antelope migrate clockwise around the popular Serengeti National Park (Tanzania)-Masai Mara Game Reserve (Kenya) ecosystem. The migration across the two countries creates time for courting, mating and birthing/reproduction along the way. The great wildebeest migration involves an estimate of 1.5million wildebeest, 500,000 Thompson’s gazelle, 200,000 zebras and 18,000 elands. This probably is the largest number of wildlife sighted a wildlife safari in Tanzania or Kenya wildlife safari. The migration pattern is a bit predictable, however, if you get your timing wrong, you will end up gazing out over a non-wildebeest savannah and wondering where all the animals went. This calls for need to work on, when and where to go in order to have a memorable view of the wildebeests. January, is a calving season with very many babies. The herds can be sighted in Tanzania’s Serengeti national park, moving south from the north-east region and into the southern Serengeti, Ndutu area and Ngorongoro Conservation area outside the confines of the national park. By February, the herds are not far away from Serengeti, they stay in the far south as they graze within Southern Serengeti, Ndutu and Ngorongoro Conservation areas. By March, tourists to Serengeti are not late yet to sight the numerous wildlife since they are still in the south. The grasses though have all been chewed up. During this time, the last calves are born and the herds are gathering in preparation to move from this point. April may not be the best month to safari Tanzania for wildebeest sighting since the animals are beginning their journey northwards and many have already left for the central and western Serengeti. In the southern Serengeti plains however, the wildebeest can be sighted as they leave this place. May is a great month because the herds are on the move. Get ready to sight huge columns of up to 40km in length as the wildebeest move up into the central and western Serengeti. This month is best for a wildlife safari in Tanzania if the reason is to see the wildebeest. In June, the tourist should head for the central and western Serengeti. This is because of the May movement since the herds are there and getting ready for the toughest part of their trek, crossing the Grumeti river. July is the greatest time ever of the event. The herds have reached the western Serengeti’s Grumeti reserve and are gazing closely at the brown waters of the rivers with the big Nile crocodiles, yet they have to cross. In August you will probably see the happiest herd ever, this is because the crocodile survivors are celebrating by feasting in the northern Serengeti and begin crossing back into Kenya’s Masai Mara National reserve. If you don’t wish to miss sighting these happy wildebeests, then prepare early because you need a passport to cross from Tanzania. In September a tourist could probably not see the large herd any more, they missed it in August. The herds break up into smaller groups, almost half of the animals remain in the northern Serengeti and the rest are in a conversation in Kenya’s Masai Mara. In October when you cross to Kenya’s Masai Mara, since that’s where the herds are, there’s much sighting of the wildebeest with many more animals. Those on Kenya wildlife safaris have an added advantage of sighting the wildebeest on top of other wildlife. The herds in November are heading back to the revived Serengeti because of the short rains that have made the grass sprout again. The year ends in December with the wildebeest clustering in the north-eastern and southern Serengeti. By this time, the cycle begins again, there’s calving again as the predators too move in and the wildebeest heartwarming and breaking wonder cycle continues. Taking a wildlife safari in the 2 countries can be tailored with another East African safari. many tailor it with either a Uganda gorilla trekking safari, gorilla safari Rwanda or Congo gorilla trekking safari since Tanzania doesn’t have gorillas. Chartered flights are organized to join the destinations.